Read the brief facts of the burning of Shakespeare’s Globe Theatre, and the sassy poems which followed. Nor thou, O ale-howse, neither. Their wives [i.e. of the owners] for feare had pissed itt out. Oh sorrow, pittifull sorrow, and yett all this is true. And laye up that expence for tiles. Oh sorrow, pittifull sorrow, and yett all this is true…. 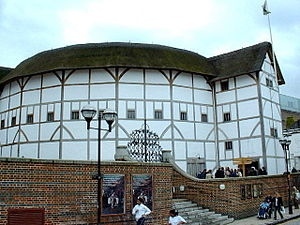 London’s current, open-air Globe playhouse was constructed 200 yards from the 1613 Globe, and is as close in design and materials as scholars and building codes could manage: the thatch is of Norfolk reed, the beams are of green oak, and the plaster is of the Elizabethan sand-lime-hair recipe (though goat hair is now used, the hair of the modern British cow having been jidged too short).